How Does Diabetes Affect the Mouth? People who have diabetes know the disease can harm the eyes, nerves, kidneys, heart and other important systems in the body. Did you know diabetes can also cause problems in your mouth? People with diabetes are at special risk for periodontal (gum) disease, an infection of the gum and bone that hold the teeth in place. Dry mouth, often a symptom of undetected diabetes, can cause soreness, ulcers, infections, and tooth decay. Smoking makes these problems worse. Mouth complications can lead to painful chewing difficulties, problems with dentures, tooth decay and even tooth loss. If your blood glucose levels are poorly controlled, you are more likely to develop serious gum disease and lose more teeth than non-diabetics. Like all infections, serious gum disease may be a factor in causing blood sugar to rise and may make diabetes harder to control. Other oral problems associated to diabetes include: thrush, an infection caused by fungus that grows in the mouth effecting denture wear, and dry mouth which can cause soreness, ulcers, infections and tooth decay (cavities) requiring restorative dentistry treatments. Good blood glucose control is key to controlling and preventing mouth disease problems. People with poor blood glucose control get gum disease more often and more severely than people whose diabetes is well controlled. Denture problems and mouth irritations are common in diabetic patients either with complete or partial dentures. Dry mouth conditions can lead to an increased risk of dental decay cavities. Daily brushing and flossing, regular dental check-ups and good blood glucose control are the best defence against the oral complications of diabetes. To control thrush, a fungal infection, maintain good diabetic control, avoid smoking and, if you wear them, remove and clean dentures daily. What about gum disease and diabetes? You may not be aware that good oral health not only keeps the mouth and gums free from periodontal disease, but also has a significant impact on the control of diabetes. People with diabetes are three to four times more likely to develop periodontal disease, which, like any other infection in the body, can impair their ability to process and/or utilise insulin. People with diabetes also tend to have more severe levels of bone loss, and often experience more aggressive mouth disease activity. This can ultimately lead to tooth loss, which can make chewing and digesting food difficult. For people with diabetes, this can have a very negative impact on the ability to maintain proper nutrition and control blood sugar levels. 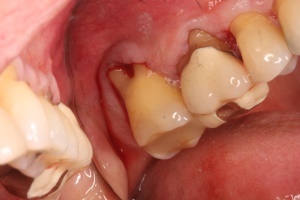 Existing gum disease in a patient who develops diabetes. Just as diabetes can increase a patient’s chance of developing periodontal disease, research suggests that periodontal disease may make it more difficult for people who have diabetes to control their blood sugar. Periodontal disease increases the body’s systemic inflammatory signals that serve to increase blood sugar. This contributes to increased periods of time when the body functions with an unhealthy blood sugar level. It is important for people with diabetes to treat periodontal disease to eliminate the infection for optimal control of blood sugar levels. Periodontal / gum disease is a leading dental complication of diabetes; therefore, it is important for you to know your treatment options. If detected early, Periodontal treatment can arrest gum disease and bring the gums back to a state of health. Other options may involve treatment of tooth loss and tooth decay, with a range of Prosthodontic / Restorative Dentistry procedures, Dental Implants or possibly Denture Solutions. Gum and diabetic health benefits from Periodontal treatment have been shown to improve blood sugar levels in people with diabetes, suggesting that treating patients’ periodontal disease could decrease insulin requirements. 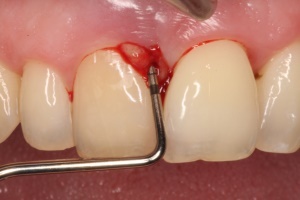 In the early stages of gum disease, treatment usually includes scaling and root planning, a procedure in which plaque and calculus are removed from the pockets around the tooth and near the gums. Teeth and existing dental restorations can be evaluated for evidence of any potential problems, for example breakdown or decay resulting from dry mouth conditions. Dentures can be evaluated to ensure adequate fit and comfort and the avoidance of any trauma to the supporting gums. If diabetes is well controlled, treatment will be similar to the treatment of someone who doesn’t have diabetes. People with diabetes may want to schedule their dental appointments early in the morning after they have eaten a normal breakfast in order to stabilize and prevent a severe or sudden drop in blood sugar levels. Upon determining a treatment plan, your dental clinician and doctor can work together to help you control both your diabetes and dental disease.